ALL OLMSTED FALLS SCHOOL DISTRICT BUILDINGS WILL BE CLOSED ON WED., JAN. 29TH DUE TO INCLEMENT WEATHER CONDITIONS. ALL AFTERNOON / EVENING ACTIVITIES WILL BE CANCELED AS WELL – INCLUDING WEDNESDAY EVENING PSR CLASSES. PLEASE WATCH FOR FURTHER INFORMATION REGARDING RESCHEDULED MEETINGS/EVENTS. 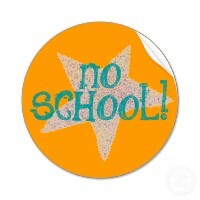 Just a reminder there will be no school this Friday, January 24th due to a District Staff In-Service Day. We will see students back in the buildings on Monday, January 27th. The presentation on the new Common Core Standards for parents and interested community members is at tomorrow night, Thursday, January 23rd at 7:00 p.m. in the Falls-Lenox Cafeteria. The presentation focuses on an overview of the Common Core Standards for both Reading and Math. Parents will see valuable and specific grade level examples. School officials will field questions from the audience. About 50 parents and community members attended last week’s presentation. Please be sure to mark your calendar to attend this important and informative event. Parents of students in all grade levels are encouraged to attend this scheduled session. As a proactive way to address the important topic of teen depression and related issues, OFMS annually offers depression awareness and suicide prevention training through the Signs of Suicide (SOS) Middle School Program. The SOS Program at OFMS will include a classroom presentation that will be conducted by our own school counselors and school psychologists. All seventh graders will participate in this program on the following days: Phoenix Team on Wednesday, January 27th; and the Griffin Team on Monday, February 10th. Detailed information on the scheduled SOS Program is being provided to parents this week. To read the letter sent to Middle School parents, please click HERE. To download the SOS: Signs of Suicide Parent Newsletter, please click HERE. The islands of Madura and Bali are part of which country? Do you know the answer? This was the winning question in this year’s OFMS Geography Bee competition held January 13th. All students at Olmsted Falls Intermediate and Middle schools participated in the qualifying round of the National Geographic Bee in November. Ultimately, 19 finalists emerged from the middle school. The national organization provided questions for the final competitions that were given orally to each contestant. 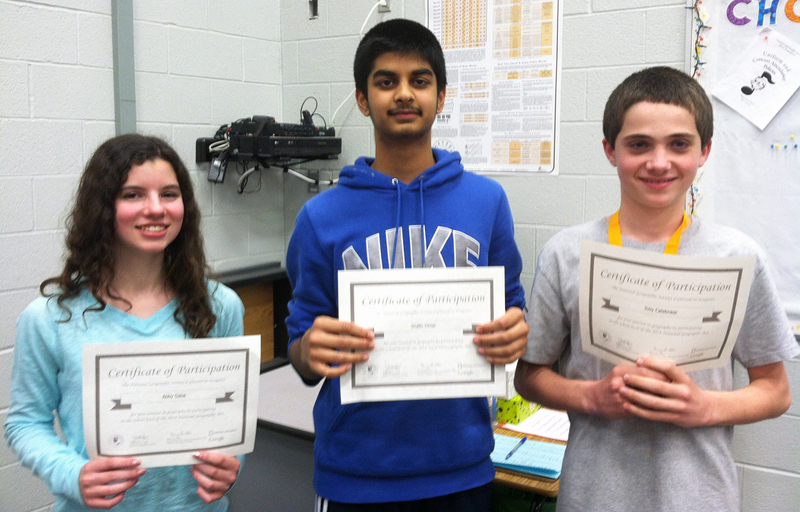 Taking first place at OFMS was Joey Calabrase; 2nd place, Shalin Desai and 3rd place, Abby Gaba. All are eighth graders. OFMS participants included Nathan Mader, Joey Lippus, John Gaba, Jacob Kerkay, Matthew Thielman, Michael Thielman, Emma Andrus, Mallory Witt, Ryan Palyo, Jake Dahlinger, Alex Bolton, Grayson Stallman, Ryan von Keyserling, Maggie Harris, Lindsay Rowe and Andrea Sheetz. OFIS first place winner was Hank Long and second place, Sanat Subhash. OFIS participants were Megan Nguyen, Ryan Graham, Issac Spittal, Jimmy Cooney, Anthony DeMarco, Kaimo Pamesa, Alaina McCollum and Jon Siudowski. The winner of the middle school competition will take a qualifying state exam. Results of that exam will determine qualification for the April 4th state competition. The state competition winner will win an all-expense paid trip for four to Washington D.C. to compete at the National level May 19-21. Congratulations to all the Bee Bulldogs and good luck in your next competition. For more OFMS photos, click HERE. For a photo of OFIS finalist participants, click HERE. Oh, the answer to the winning question: Indonesia. Did you know it? 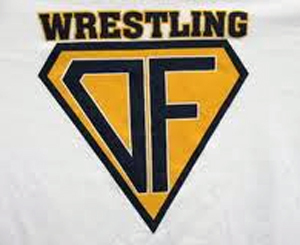 The OFHS wrestling team would like to honor all past OFHS wrestlers this Friday, January 24th. We will wrestle Bay Village and Valley Forge that evening. Wrestling will begin at 6 p.m. We would like to recognize all former wrestlers halfway through the match, at about 7 p.m. Coach Bryce Burkhard asks that when you arrive, please check in with Johnny Miller so your name will be announced at that time. Please join us to help celebrate the past success of the Bulldog wrestling program. For seniors interested in applying for the Local Scholarship Program, applications are now available in the OFHS Counseling Office. All Local Scholarship Applications must be returned no later than 3:00 p.m. Thursday, February 13th. Last year, thanks to the generosity of 77 local community donors, the OFHS Local Scholarship Program awarded more than $115,375 through 231 scholarships for members of the Class of 2013. Local Scholarship Applications can be picked up in the Guidance Office, or downloaded from the Counselors’ Corner section of the High School website. Please contact Ms. Tommye Laut, 427-6116, with any questions. February 7th – Registration Instruction Pick-Up Begins at the Early Childhood Center, 7105 Fitch Road, between 7:30 a.m. and 3:30 p.m. on school days. March 11th – 13th Kindergarten Registration at Early Childhood Center, by appointment. April 30th & May 1st Kindergarten Screening at Early Childhood Center, by appointment. Please call (440) 427-6360 with questions or email Melinda Brunner, ECC Director, at mbrunner@ofcs.net. Bargain Bonanza is a consignment-style super sale. This year the OECPTA-sponsored event is March 8 at the OFMS cafeteria. The cafeteria is organized with thousands of clothing items for sale all sorted by size and gender and the gymnasium is packed full of toys, baby gear and so much more. Anyone may register to be a seller, but the PTA does have a cap of 130 sellers. 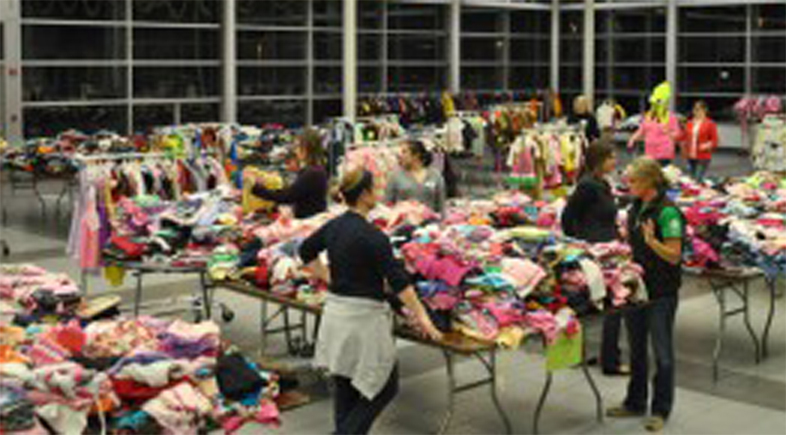 Unlike other sales, this one allows sellers to drop off their items with tags purchased from OECPTA and members do all the hard work of sorting and running the actual sale. After all the tags are added up, checks are cut and you get your proceeds minus 10% for members of OECPTA and 12% for non-members. If you are interested or want to learn more, please refer to the website by clicking HERE Contact Melissa Schwecke at Schwecke@cox.net and she will send you the necessary paperwork to fill out. Players and parents are invited to attend the 7:30-9 p.m. Wednesday, February 12th meeting for the 2014 OFHS Boys Soccer program in the high school media center. All players in grades 8-11 who plan to try out and play soccer for OFHS in 2014 must attend with a parent. If for some reason, such as club training, soccer game, etc. you cannot attend, please have a parent attend. Important information about the off-season and upcoming season will be discussed. For more details, go to the soccer website by clicking HERE. If you have questions, contact Coach Walchanowicz, OFHSSoccer@sbcglobal.net. PTA BATTLE OF THE SCHOOLS IS ON – THURSDAY, FEBRUARY 13th! 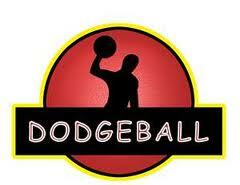 This year we are playing DODGEBALL again! Come out and support your school! 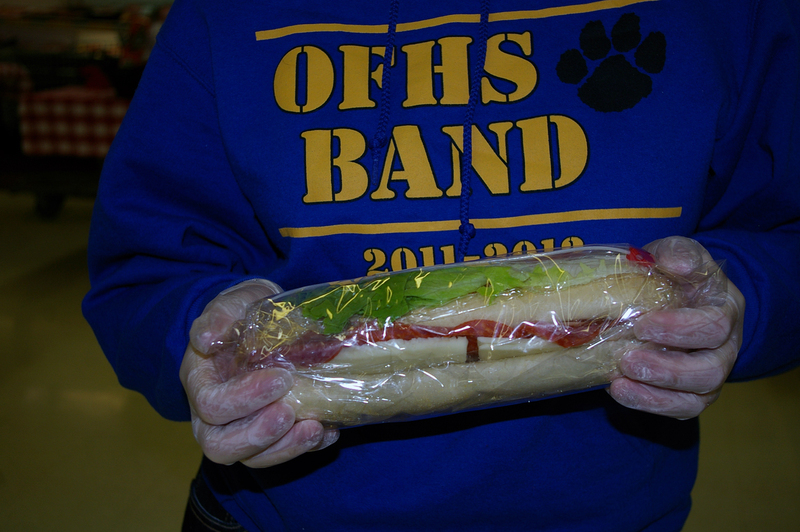 Olmsted Falls Music Association is sponsoring its annual Super Bowl Hoagie Sale where each student has the opportunity to earn at least $3 for every $5 hoagie they sell. Funds will be placed in the child’s own account to be used for music travel in high school. Students must see their music teacher for order forms. Order and monies will be due TOMORROW Thursday, January 23rd. Hoagie pickups will be Saturday, February 1, between 11 a.m. and 2 p.m. at Shaker’s IGA. Extra sandwiches will be available for on-hand purchase. Please help our student musicians share their talent and enjoy school travels. Click HERE for complete student order form and HERE for student envelope form. Plan to take the family out for lunch or dinner Monday, January 27, 2014 at North Olmsted’s Applebee’s in Great Northern Mall. OFHS Post Prom will receive 15% of your check when you dine there from 11 a.m. to 9 p.m.
You must present the flyer that may be printed by clicking HERE. The OFHS Swim & Dive Team invites the community to its annual Dinner and Raffle from 6-9 p.m. Tuesday, February 18th at the OFHS cafeteria. This year the event has a luau theme. For more details, or if you have a donation for the raffle, call Tessa, 440-228-8160. Some of the raffle items this year include a 42-inch flat screen TV, iPad Air, SOL headphones and much more! Dinner tickets are $10 for adults and $6 for those 10 and younger. Order deadline is February 14th. For a dinner registration form, click HERE. 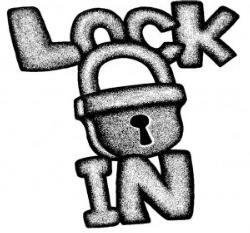 The OFMS Web lock-in is from 8 p.m. Friday, February 21st to 7 a.m. Saturday, February 22nd. The event is for eighth grade WEB leaders and sixth grade students only. Participants will have the opportunity to play basketball, dodge ball, snacks, nail painting, cooking, dancing and other activities. Donations for door prices, such as gift cards, gift baskets and games, are being accepted now through February 22nd. The 11-U Olmsted Falls Travel Baseball winter tryouts are this Saturday, January 25th in the Olmsted Falls High School gym. Registration is at 8:30 a.m. with tryouts, 9-10 a.m. For more details, contact Duane Meyer, 16083202mmm@gmail.com or 440-773-7668; Jon Vas, vasjc@ameritech.net, 440-759-8632 or Jeff Cooney, cooney.29@gmail.com, 440-773-8614. For a complete flyer, click HERE. Registration is now OPEN for the Olmsted Falls Soccer Association’s (OFSA) Spring Recreational Soccer Program (REC). This program is opened to players between the ages of 4 to 14 and a high school division. All the games are played at Shady Soccer Fields in Olmsted Falls on Saturday mornings between 9:00 – 2:00 pm. Please visit our registration web page to register your child and to access more information under the “league” tab and “recreation league” selection at www.olmstedsoccer.com. The registration deadline is April 2nd. OLMSTED PERFORMING ARTS OFFERS CHILL BREAKER FOR KIDS 5-14 THIS FRIDAY, JANUARY 24. Olmsted Performing Arts offers a way to break this chill. 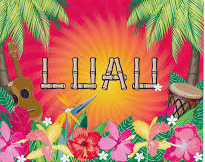 Kids are invited to its mid-winter Luau and Lock-In. The Luau is from 5:30-9 p.m. Friday, January 24 and the Lock-In, 9 p.m. Friday, January 24 through 7 a.m. Saturday, January 25. Kids ages 5-14 are welcome. Admission to the Luau is free and includes live music. Tickets may be purchased for $1-5 each or 25 for $20 to participate in games, crafts, sundae bar, photo booth and food that Jo Jo’s Italian Restaurant will provide. The annual lock-in, which includes a Nerf war, dance off, open gym and more, immediately follows the luau. The Lock-In costs $20 a person. Online registration is available by clicking HERE or calling 440-235-6722. 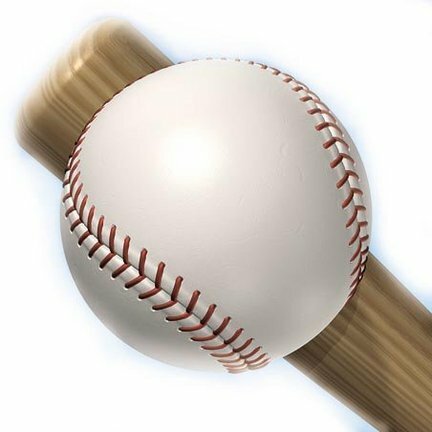 FIRST OLMSTED TRAVEL BASEBALL ASSOCIATION LORAIN COUNTY HOT STOVE TEAMS SIGN UP WEDNESDAY Olmsted Travel Baseball Association now is accepting registration for players ages 6-14 who want to participate in its Lorain County Hot Stove League (LCHS). Registration is on two dates: January 22nd and February 5th both from 6-8 p.m. in the OFHS cafeteria. Teams will play on fields up to 45 minutes away. Play begins around May 1 and ends mid-July. Hot Stove is not an instructional league. Players should possess a moderate knowledge of baseball rules and whose skills allow them to play at a moderate to high level of competitive baseball. The registration form may be downloaded from the OTBA website by clicking HERE. A detailed flyer about the registration is obtainable by clicking HERE. 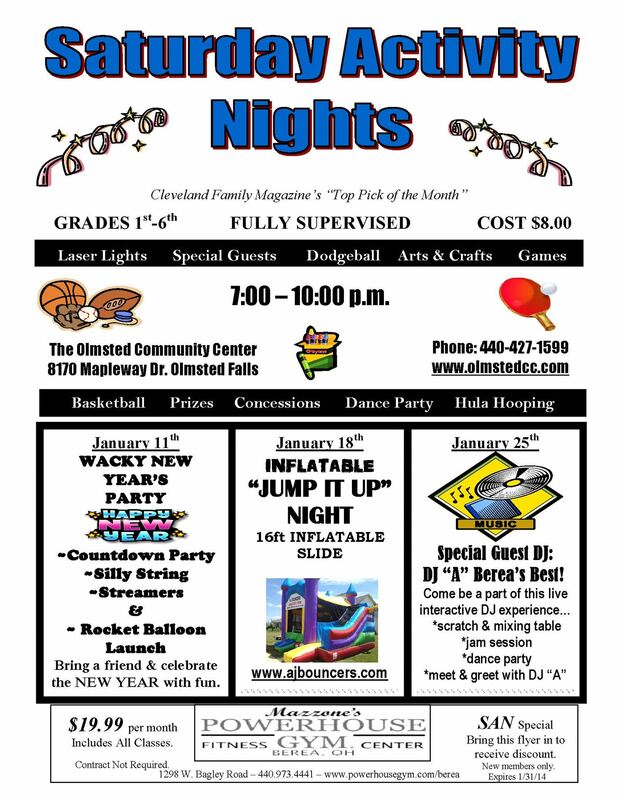 Olmsted Community Center’s Saturday Activity Nights’ January 25th event highlights a special guest – DJ “A” – who will mix, scratch and give new meaning to dance and remix music fun. Those in grades 1-6 also can enjoy basketball, dodge ball and fuse art. The session runs from 7-10 p.m. and costs $8. For full details about the event, click HERE. Learn some basic skills in original cake and cookie decorating, then enter your creativity in a contest. The Olmsted Falls Branch Library has the class from 7-8 p.m. Thursday, February 6th where those in grades 6-12 get hands-on experience using frosting tips, a pastry bag and colored frosting. All supplies are provided. They also take their cookies home! Registration is required. They then can try their decorating skills by entering the Bake-A-Book, Win a Nook contest on Saturday, April 12th in the Parma-Snow Branch Library’s auditorium. A parent or legal guardian must sign a release and hold harmless form before the program for the teens to be able to work with food. Contact the OF Library for the form. To learn more about the contest, click HERE. 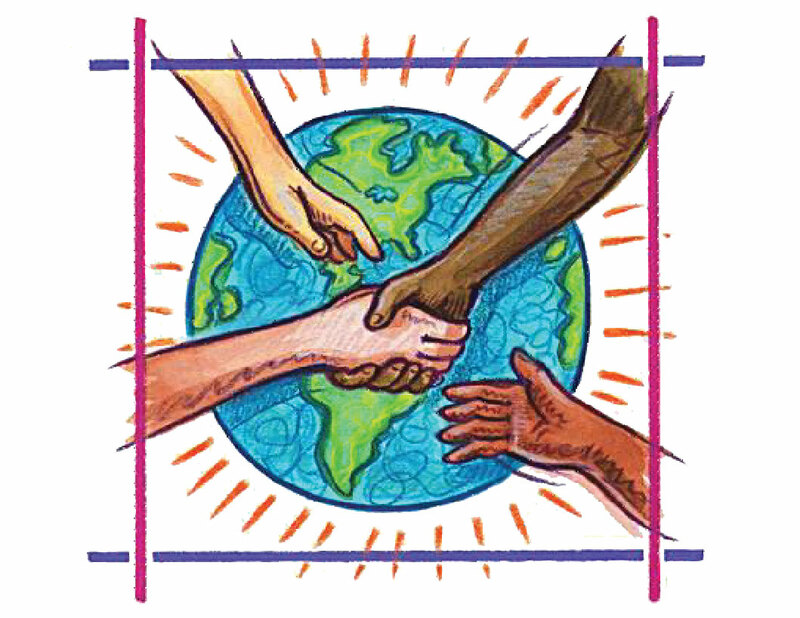 This is just a reminder that there will be no school this Monday, January 20th for the Martin Luther King holiday. There also will be no school next Friday, January 24th due to a District Staff In-Service Day. Please note these dates on your calendar. Thank you. Approximately 50 parents and community members joined Assistant Superintendent Ms. Kelli Cogan in the OFHS auditorium last night for a presentation on the new Common Core State Standards. 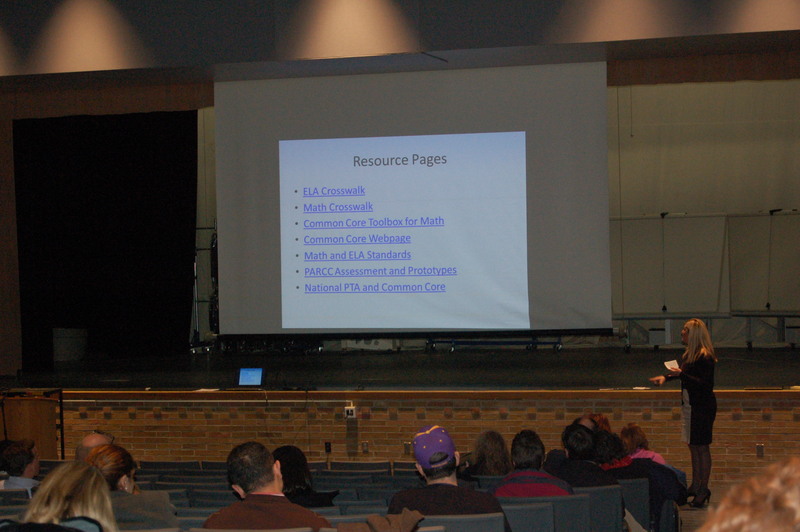 The presentation focused on an overview of the Common Core Standards for both Reading and Math. Ms. Cogan provided parents with valuable and specific grade level examples. At the conclusion of the presentation, Ms. Cogan, joined by Superintendent Dr. Jim Lloyd, answered additional questions from the audience. Please be sure to mark your calendar to attend this important and informative event. The content of next week’s session will be essentially the same as the content covered at the first session. Parents of students in all grade levels are encouraged to attend next week’s scheduled session. Last Thursday, the Olmsted Falls Board of Education held its Annual Organizational Meeting at 7 p.m., prior to the start of its regular meeting for the month of January at 7:30 p.m. At the Organizational Meeting, the Olmsted Falls Board of Education welcomed two new Board members – Mrs. Holly Neumann and Mrs. Linda Parkowski, who were both elected in the November 2013 election. 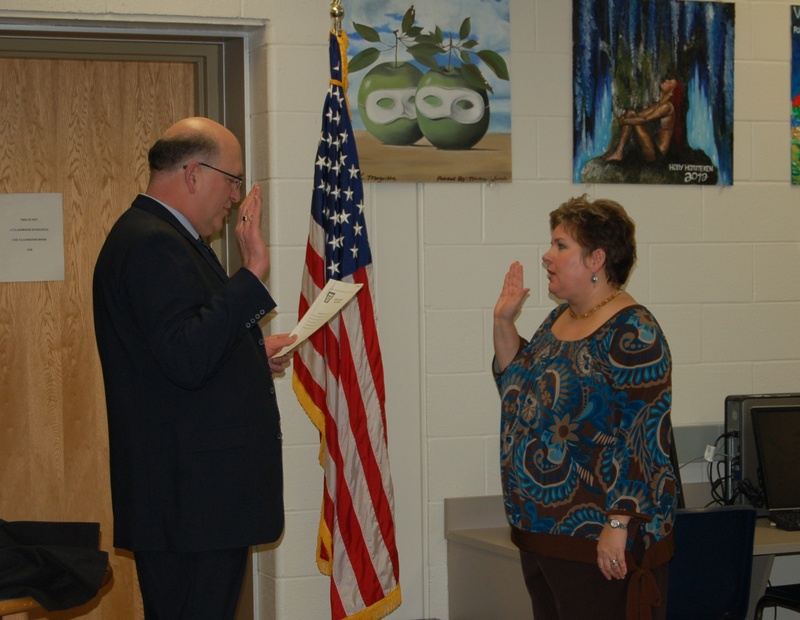 Mrs. Neumann and Mrs. Parkowski were each officially sworn in by District Treasurer Mr. Mark Hullman. 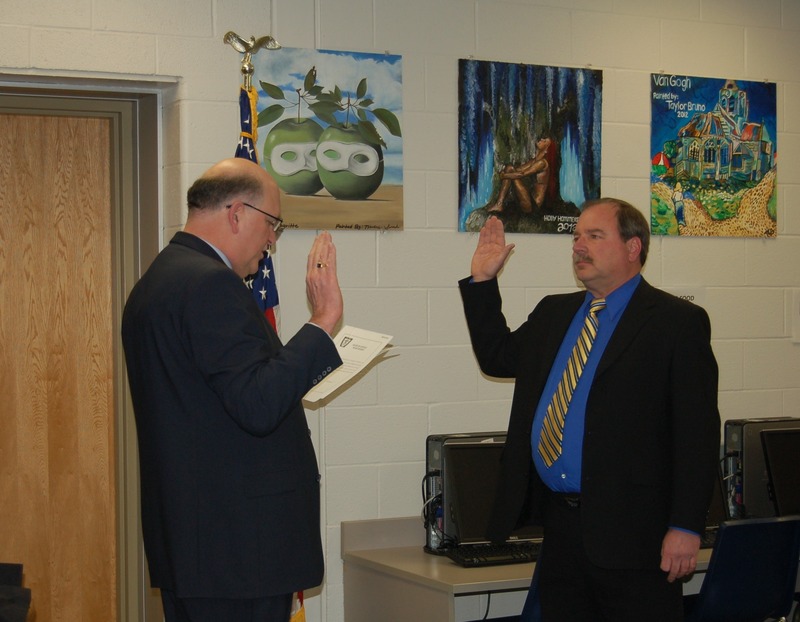 Returning Board member Joe Bertrand, re-elected in the November 2013, was also sworn it to serve another term. 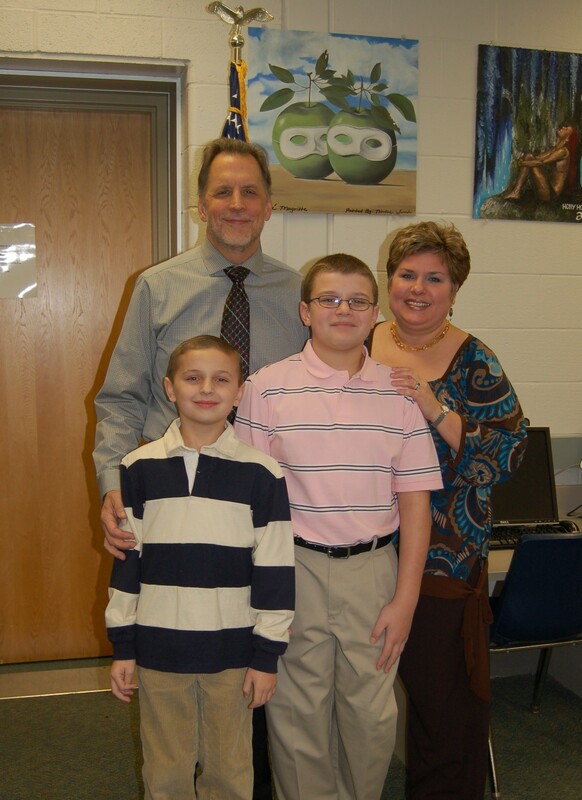 New Board of Education Member Mrs. Holly Neumann with her husband, David, and their children, at January Organizational Meeting. 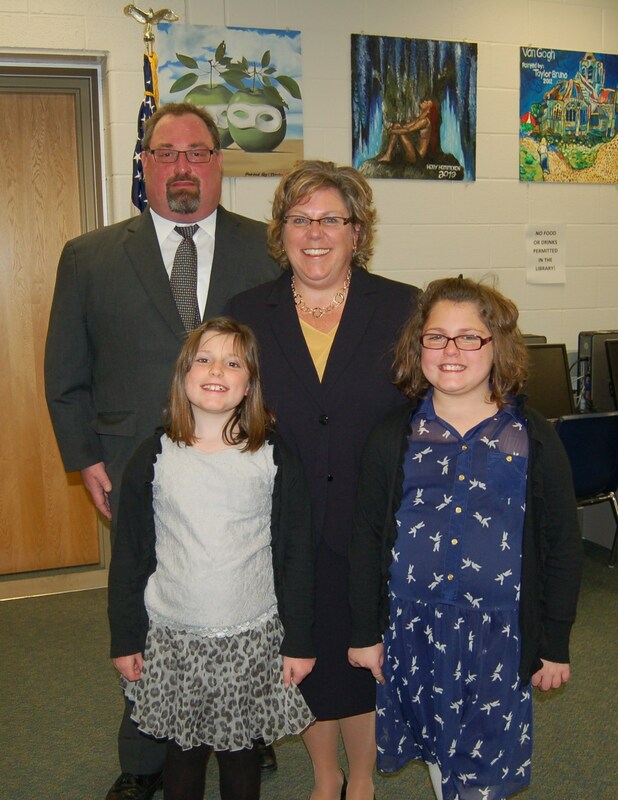 New Board Member Mrs. Linda Parkowski with her husband, John, and their children, at the Organizational Meeting. In addition, during the Annual Organizational Meeting, Mr. James Weisbarth was elected to serve as Board President for calendar year 2014; and Mr. Joe Bertrand was elected to serve another year as Board Vice President. Mr. Weisbarth will also serve as the Board’s legislative liaison for 2014. We extend both congratulations and thanks to these individuals for taking on these additional responsibilities in the coming year. 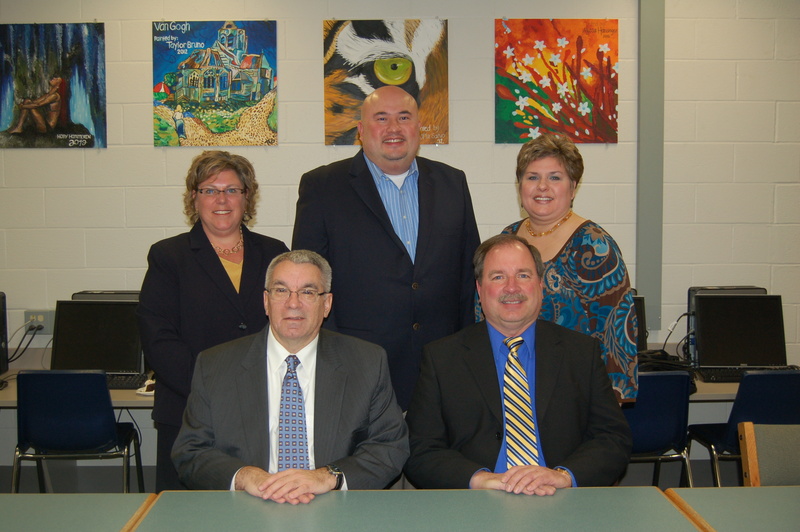 Please join us in welcoming Mrs. Neumann and Mrs. Parkowski, and in congratulating Mr. Bertrand on his re-election. Front row: Board President Mr. Jim Weisbarth (19th year of service) and Board Vice President Mr. Joe Bertrand (10th year of service). Back row: Board Members Mrs. Holly Neumann (1st year of service), Mr. Greg Surtman (3rd year of service) and Mrs. Linda Parkowski (1st year of service). 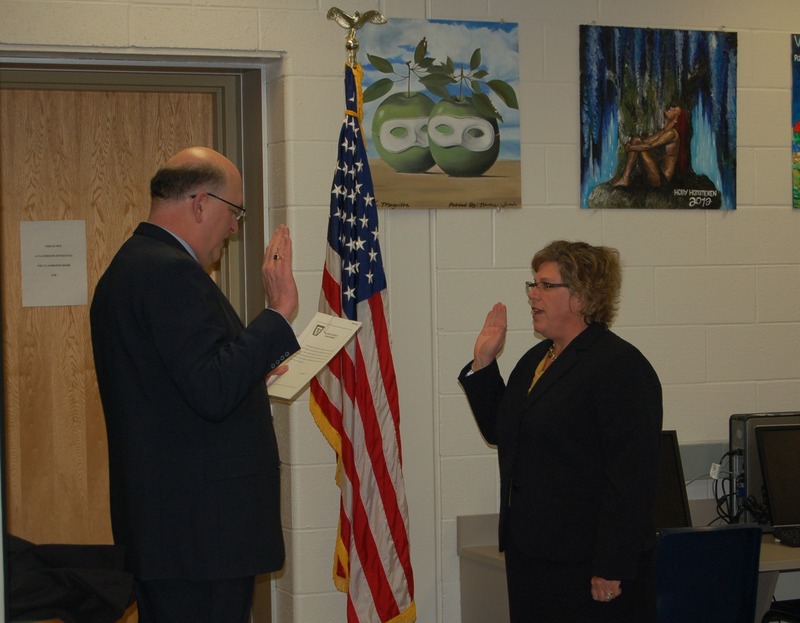 The Olmsted Falls Board of Education, at its regular monthly meeting held January 9th, unanimously passed the final resolution required to place a 1.8 mill bond issue for Olmsted Falls High School back on the election ballot this May. The bond issue, dedicated to addressing overcrowding, safety and security at Olmsted Falls High School through building renovation and expansion, was originally defeated this past November with 2,904 in favor of the bond issue and 3,438 against. The defeat of the issue did not eliminate the need to address these critical issues at the high school. Therefore, the District plans to continue its efforts to educate the community about the need. Passage of the resolution of necessity back in December was the first legislative step required to place the bond issue back on the ballot in May 2014. The Board’s passage of a resolution to proceed at last week’s monthly meeting for January was the final piece of legislation required to place the issue on the May ballot. Any parents or residents with questions about the 1.8 mill bond issue for Olmsted Falls High School are encouraged to contact the Board of Education office at 427-6000. January is School Board Recognition Month in Ohio. Olmsted Falls School District took the opportunity to publicly thank our local Board of Education members during their regular monthly meeting held this past Thursday. 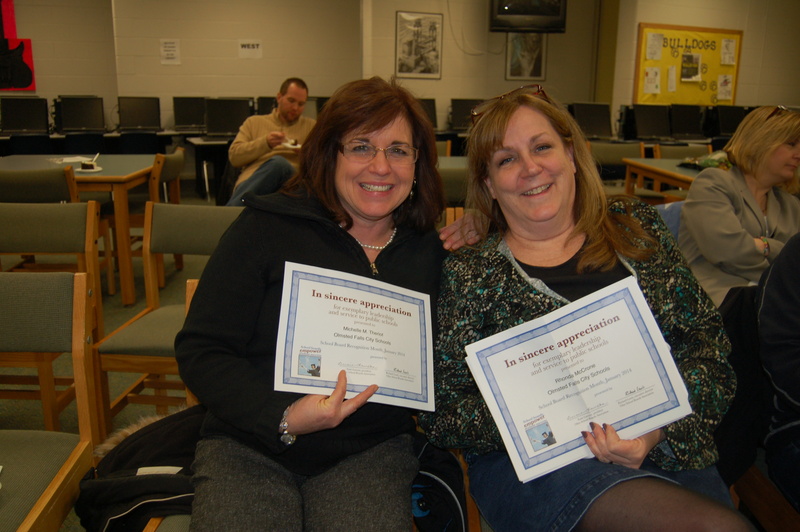 Each Board member – including recently retired Board members Ms. Michelle Theriot and Mrs. Rhonda McCrone (pictured at left)– received a certificate of recognition from the Ohio School Board Association, presented by Superintendent Dr. Jim Lloyd. 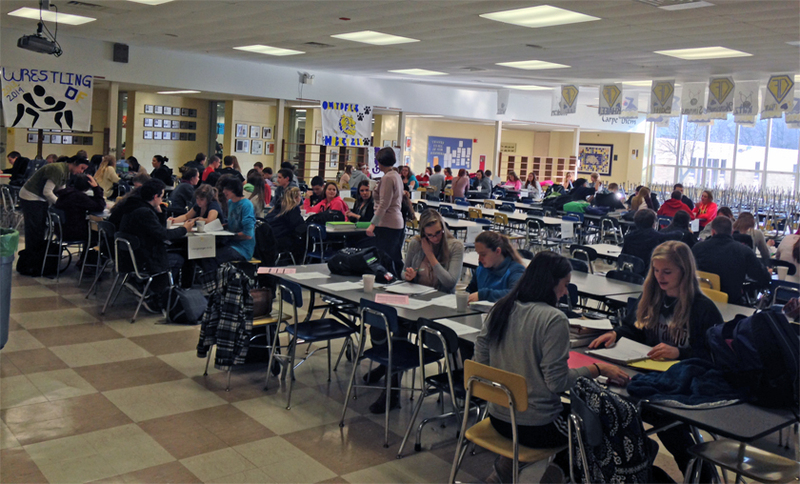 Tuesday’s ‘Cocoa and Cram’ study session at OFHS gave freshmen students a chance to work together as they prepare for this week’s First Semester Exams. It took place from 2:16-3:30 p.m. in the cafeteria and was well attended. A special thanks to Student Ambassadors who hosted the session and to those who participated in preparing for the exams. Congratulations to Zach Sadowski for being Elyria Chronicle’s player of the week. To see a copy of the article, click HERE. Helping Hands, the district’s disability awareness group, will host “Dance 4 Charity,” a fundraising event on February 22, 2014. This 4-hour ‘mini-dance marathon’ will help promote disability awareness. Teams of at least five people must be organized and registered by January 17. Each team will choose a captain and decide to which of the four chosen charities they would like to donate their pledges. The charity options are: Autism Speaks, CTSF, Special Olympics or SWAN USE. Click HERE for the charity descriptions. Do you think you have talent? 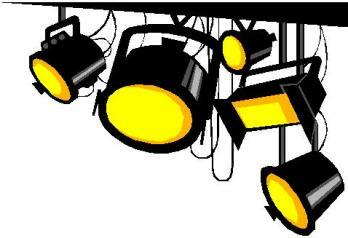 The 27th Annual Olmsted Falls Friday Night Talent Show auditions will be held on Saturday, January 18, 2014 from 9 a.m. to noon in the OFHS auditorium. Please watch this weekly blog, look for posted flyers in your school and check your school website for more details. Contact Mrs. Ferrini with questions at 440-427-0894. Olmsted Falls High School is very proud to announce that we will be hosting the 1ST Annual OFHS Girls Fastpitch Softball Skills Clinic on Monday January 20th, 2014 (MLK Day) from 1:00-4:00pm for all interested girls grades 1-8! The cost is $25, and includes a camp shirt! The camp will consist of fundamentals in hitting, fielding, throwing, pitching, catching, and base-running. Come join us for a day of valuable softball knowledge and fun. Instructors will include the OFHS softball coaching staff, OFHS Head Baseball Coach Dan Largent, former Strongsville Head Coach Jeanette Howard, and current Bulldog players. All ability levels are welcome to attend – even beginners! Registrants can either bring their form/payment directly to camp on 1/20, or mail to the address on the form by Wednesday 1/15! Please click HERE for registration form. AN EVENING WITH RENOWNED AUTHOR DONALD DAVIS – THIS TUESDAY, JAN. 21ST @ 7 p.m.! On Tuesday, January 21st, the fourth and fifth grade students at the Olmsted Falls Intermediate School will meet a world-renowned author and storyteller! Donald Davis, who was born and raised in the mountains of North Carolina, will be returning to OFIS. He will be sharing some heart-warming and hilarious stories from his childhood. Mr. Davis will also have an evening performance at 7:00 PM for the entire Olmsted Falls Community at Olmsted Falls Intermediate School. Please plan on attending with the whole family! You won’t want to miss this special family event! For additional information, please click HERE to download event flyer. The regular monthly meeting of the OFIS PTA, originally scheduled for January 21st, has been canceled to allow for members to attend the very special family event with renowned author Donald Davis. OFIS PTA encourages all OFIS parents and families to attend “An Evening with Donald Davis” (see above) at 7 p.m. in the OFIS gym instead of the monthly PTA meeting. “An Evening with Mr. Davis” is an event you won’t want to miss. Mark your calendars and enjoy! Middle School student received yearbook order forms to bring home this week. If you are interested in ordering a 2013-2014 Olmsted Falls Middle School Yearbook, please return the order form, along with your check payable to LIFETOUCH, to the Middle School by Tuesday, January 21st at the latest. You may also place yearbook orders online at https://ybpay.lifetouch.com/Order/SelectJob, with yearbook ID code: 11666914. A BIG BULLDOG THANK YOU! 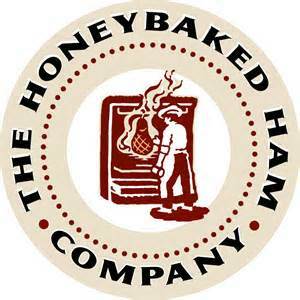 The Olmsted Falls Swim & Dive Boosters would like to thank everyone who supported our Ham Sale this season. We had record-breaking sales and were able to raise additional funds to help pay for added pool time for our team. In addition, a big thanks to all those who volunteered their time, to organize the event, print materials, encourage sales and help with the sorting and delivery of all that ham right before Christmas! We appreciate the support and the swimmers and divers appreciate their improved scores with all that additional practice! Thanks again to the Olmsted communities! The OFHS wrestling team would like to honor all past OFHS wrestlers on Friday, January 24th. We will wrestle Bay Village and Valley Forge that evening. Wrestling will begin at 6 p.m. We would like to recognize all former wrestlers halfway through the match, at about 7 p.m. Coach Bryce Burkhard asks that when you arrive, please check in with Johnny Miller so your name will be announced at that time. Please help celebrate the past success of the wrestling program. Order and monies will be due Thursday, January 23rd. Hoagie pickups will be Saturday, February 1, between 11 a.m. and 2 p.m. at Shaker’s IGA. Extra sandwiches will be available for on-hand purchase. Please help our student musicians share their talent and enjoy school travels. Plan to take the family out for lunch or dinner January 27, 2014 at North Olmsted’s Applebee’s in Great Northern Mall. OFHS Post Prom will receive 15% of your check when you dine there from 11 a.m. to 9 p.m. The OFMS Web lock-in is from 8 p.m. Friday, February 21st to 7 a.m. Saturday, February 22nd. The event is for eighth grade WEB leaders and sixth grade students only. Participants will have the opportunity to play basketball, dodge ball, snacks, nail painting, cooking, dancing and other activities. Donations for door prices, such as gift cards, gift baskets and games, will be accepted in the Guidance Office from January 21st through February 22nd. 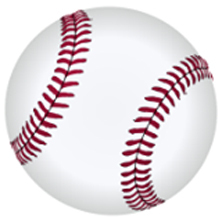 The 11-U Olmsted Falls Travel Baseball winter tryouts are on Jan. 25 in the Olmsted Falls High School gym. Registration is at 8:30 a.m. with tryouts, 9-10 a.m. For more details, contact Duane Meyer, 16083202mmm@gmail.com or 440-773-7668; Jon Vas, vasjc@ameritech.net, 440-759-8632 or Jeff Cooney, cooney.29@gmail.com, 440-773-8614. For a complete flyer, click HERE. OLMSTED PERFORMING ARTS OFFERS CHILL BREAKER FOR KIDS 5-14 JANUARY 24. 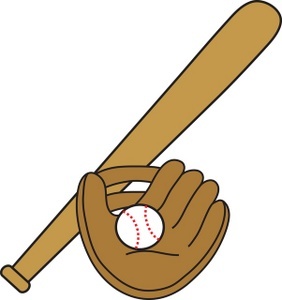 The Olmsted Travel Baseball Association now is accepting registration for players ages 6-14 who want to participate in its Lorain County Hot Stove League (LCHS). Registration is on two dates: January 22nd and February 5th both from 6-8 p.m. in the OFHS cafeteria. Teams will play on fields up to 45 minutes away. Play begins around May 1 and ends mid-July. Hot Stove is not an instructional league. Players should possess a moderate knowledge of baseball rules and whose skills allow them to play at a moderate to high level of competitive baseball. The registration form may be downloaded from the OTBA website by clicking HERE. A detailed flyer about the registration is obtainable by clicking HERE. Parents are invited to bring your kids inside the Olmsted Community Center for its weekly Saturday Activity Nights to run off their energy. They can enjoy some warm fun indoors! Each session runs from 7-10 p.m. and costs $8 for those in grades 1-6. The next event is Saturday, January 18th with a 16-foot inflatable slide by AJ Bouncers and enjoy games, prizes, basketball, crafts and fun with your friends. A special guest — DJ “A”– is an interactive DJ for Saturday, January 25th, who mixes, scratches and gives new meaning to dance and remix music fun. Also enjoy basketball, dodge ball and fuse art. For full details about this month’s activities, click HERE. To learn more about Olmsted Community Center, click HERE. Olmsted Falls School District will host two informational sessions for parents and interested residents regarding the new Common Core standards and how our District is preparing. Mark your calendar to join us on Thursday, January 16, 2014 from 7-9 p.m. at Olmsted Falls High School Auditorium or Thursday, January 23, 2014 from 7-9 p.m. at Falls-Lenox Cafeteria. Each year, with the arrival of winter weather, we receive a number of questions regarding our District’s policy for closing school due to inclement weather conditions. We understand that the decision to close schools has an enormous impact on all of our families. To read more about how Olmsted Falls School District determines snow days, please click HERE. A special THANK YOU to all who supported and encouraged those involved in this school year’s OFHS Student Council Food Drive. Donations totaled 2,268 items. This initiative has generated more than 13,000 cans/boxes/bottles of non-perishable food items for our communities’ needy over the last five years. The final tally of this friendly competitive class contest included freshmen: 885 items; seniors, 698; juniors, 348 and sophomores, 211. Sean Pellerite’s freshman homeroom was overall champs for the third time in five years. His class will receive a Panera breakfast. Judy Crandall’s senior homeroom also gets a Panera breakfast for its 265 donations. Jim Yandell’s junior class collected 152 items and Jim Ryan’s, 200, gathered by his sophomore homeroom. The latter two will have a Dunkin’ Donuts breakfast. Tom Gibeaut gives special thanks to Holly Curran and Chris Kemock for the use of the media center to store the food and the school’s custodial staff, allowing the student collectors to utilize the carts to transport the goods and accumulate spare boxes to store the food. He also gives a pat on the back to Reilly Gomez, Erin Hetchler, Zach Buchta, Deborah Makari, Michael Doherty and Amelia Le for moving the food from OFHS to Olmsted Community Church. 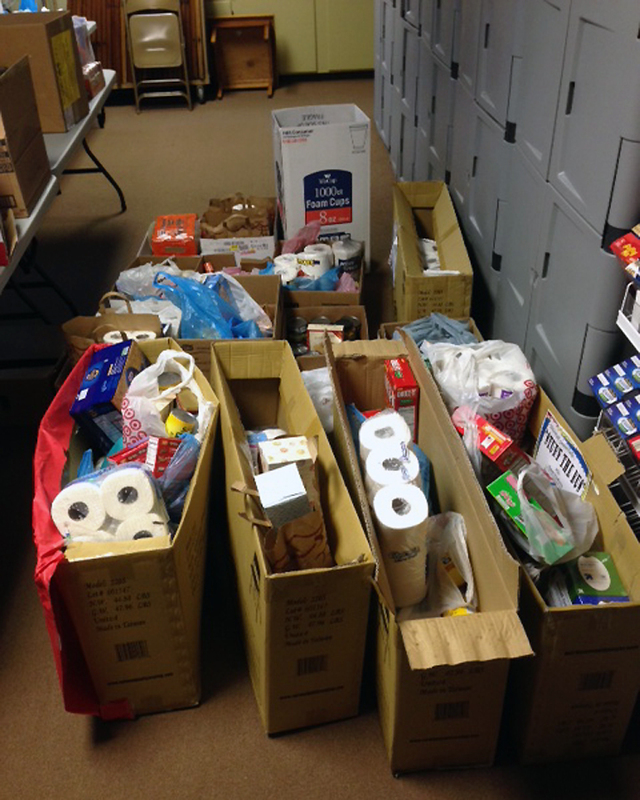 The donations will greatly benefit many needy families in the Olmsted Falls/Township community. 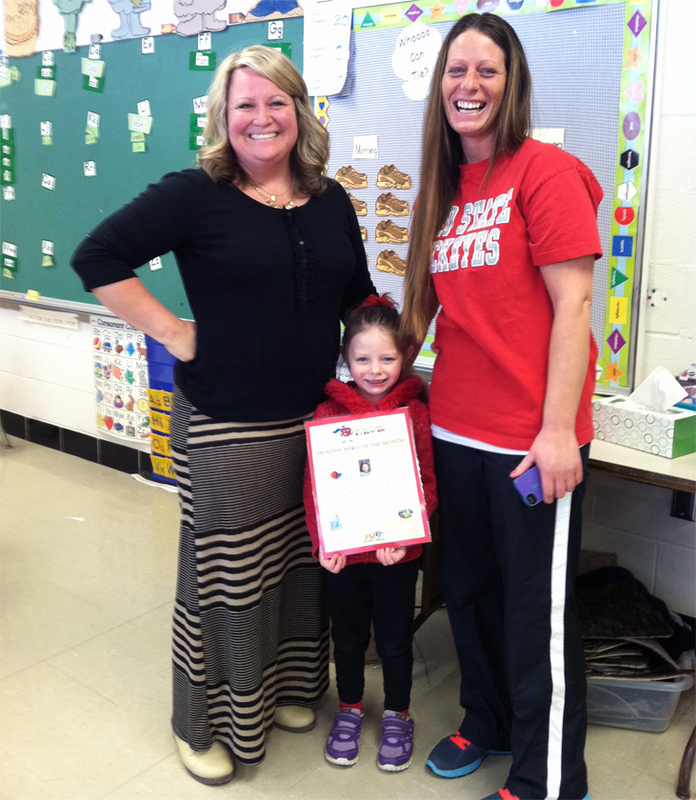 Congratulations to Kate Gordon-Navratil for being the Healthy Hero of the month. She is shown here with her mom and Mrs. Heinrich. Kate received a $5 gift card to Target for the honor. The Healthy Hero program teaches kids in grades pre-K to 3rd such healthy habits as eating right, exercising every day, power washing their hands, coughing and sneezing into their sleeve and sleeping well. Students receive a small prize for doing these healthy habits at home. Each month participants are entered into a drawing to receive a prize. Congratulations to all who practice these healthy habits every day. The school district’s Transportation Department helped local families and students this holiday season. Its “Stuff the Bus” project placed boxes at each district building where anyone interested could donate non-perishable food donations and personal hygiene products. This staff-powered initiative garnered more than 300 pounds of items to the communities’ Christians in Action food pantry based at Olmsted Community Church. CIA assists about 120 families in need in our local community and provides for more than 100 students in the OF school district. A hearty Bulldog THANK YOU for all who generously donated to this cause. We want to thank all those students who participated in this year’s Great Western Fund Raiser. We would like to announce our top 3 sellers this year. 1st place is J. Lemmons. He will receive a gift card to Kalahari Waterpark. Our 2nd place seller is S. Moses. She will receive 4 tickets to Cedar Point. Our 3rd place seller is C. Guzik. He will receive a $50.00 gift card for Swing-N-Things. Congratulations to our top sellers! Our top classrooms for each grade were as follows: Kindergarten: Mrs. Michaels -AM; 1st Grade: Ms. Sanfilippo; 2nd Grade: Mrs. Repieky; and 3rd Grade: Mrs. Sparks. Great job to all! Thanks again! AN EVENING WITH RENOWNED AUTHOR DONALD DAVIS – TUES., JAN. 21ST @ 7 p.m.! On Tuesday, January 21st, the fourth and fifth grade students at the Olmsted Falls Intermediate School will be meeting a world-renowned author and storyteller! Donald Davis, who was born and raised in the mountains of North Carolina, will be returning to OFIS. He will be sharing some heart-warming and hilarious stories from his childhood. SOUTHWEST GENERAL HEALTH CENTER HOSTS OPEN HOUSE FOR NEW EMERGENCY ROOM THIS SATURDAY, JANUARY 11TH – NOON TO 3 P.M. This Saturday, January 11th, Southwest General Health Center invites all Olmsted Falls and Olmsted Township residents to the Grand Opening of their new, state-of-the-art Emergency Department. Join OFHS Athletic Trainers Max Benton and Dave Godfray for this special community health event. Free screenings, tours, entertainment, children’s activities, raffles, food, giveaways and so much more! Plus, learn more about the “Register and Wait at Home” scheduling feature. Don’t miss this exciting event! The Olmsted Falls Lacrosse Association will have its Information and Registration Night at the Middle School Cafetorium to kick off its 5th season. 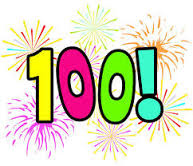 We are now 200 strong and developing some of the best players in the North East Ohio area! 2013 was a great year and included the introduction of boys and girls high school teams and the addition of a middle school girls team. We are again offering a 10 week developmental program for K-2nd grade boys and girls. Join us for one hour and learn about the “Fastest Game On Two Feet” — Find out more online at olmstedfallslax.com. To download the informational flyer and registration form, click here. Saturday, January 11th is a Wacky New Year Party. It includes a countdown, silly string, streamers and indoor rocket balloon launch. Slide into 2014 on Saturday, January 18th with a 16-foot inflatable slide by AJ Bouncers and enjoy games, prizes, basketball, crafts and fun with your friends. A special guest — DJ “A”– is an interactive DJ for Saturday, January 25th, who mixes, scratches and gives new meaning to dance and remix music fun. Also enjoy basketball, dodge ball and fuse art. Olmsted Falls School District will resume tomorrow (Wednesday, January 8th) and it won’t be without possible transportation challenges. The plan is to have our staff get to the bus garage early so they can begin procedures to get our fleet ready for operation. While we will do our very best to ensure all buses arrive on time to pick up the students taking them, please know diesel engines have issues operating in the extreme cold conditions when they are initially fired up. In short, it takes some time for buses to get their operating engine temperatures to a level where the cold is irrelevant. Also, a delayed start is not an option in our district for several reasons—we provide out of district transportation to parochial schools, we have a ½ day kindergarten program, and so on. While tomorrow will be much “warmer” than it was today, it will still be cold. Please have students dressed and prepared for the weather conditions accordingly. Thank you. District Closure Notice – Posted 1/5/14 6:05 p.m.
ALL OLMSTED FALLS SCHOOL DISTRICT BUILDINGS WILL BE CLOSED ON MONDAY, JANUARY 6TH AND TUESDAY, JANUARY 7TH, DUE TO INCLEMENT WEATHER CONDITIONS.